On Wednesday the 10th February a group of students and visitors gathered for a seminar, as part of the Annual Conference 2010, under the supervision of ECLA faculty member Tracy Colony. The seminar – “Translating Philosophy and the Philosophy of Translation”- focused on translations into English of the work of Martin Heidegger. The task of translating Heidegger’s writings presents a uniquely difficult challenge on a number of counts. Firstly, due to the strict regulations on translation methods imposed by those responsible for overseeing Heidegger’s estate at the philosopher’s own behest, the world of Heidegger translation is subject to a strict code of intellectual conduct. Further, Heidegger’s consistent deployment of compound technical terms, which forms a vital dimension of his unorthodox manner of doing philosophy, calls for careful and often challenging translation decisions. Attempting the task of such important translation work demands a delicate understanding of the nuances of the German original, for which a comprehension of the play of etymological meaning and of the subtle conceptual substructure of the writings as a whole is indispensable. In preparation for the seminar, students and guests were asked to read the ‘Review and Overview of Recent Heidegger Translations and Their German Originals: A Grassroots Archival Perspective’ by the eminent Heidegger scholar, Professor Theordore Kisiel. The focus of the seminar discussion fell on the massively contentious first—and highly anticipated—translation into English of Heidegger’s Beiträge zur Philosophie (Vom Ereignis). The translation, by Parvis Emad and Kenneth Maly, of Contributions to Philosophy (From Enowning) is characterised by Kisiel as a “major disappointment”. Discussion of this text provided the group with the opportunity to consider what has been widely criticised within the community of Heideggerian scholarship as a translation disaster of epic proportions. The translators, as Kisiel derisively points out, have on multiple occasions elected to translate Heideggerian terms into strikingly opaque and often unwieldy English neologisms. One such example is the rendering of the German verb ersehen with “to ensee”. This is a particularly awkward choice given the existence of the alternative “to envision” which is already present in common English usage. A plethora of similarly obtuse words using the prefix ‘en’ appear throughout the translation. In addition, so claims Kisiel, the translators appear to have entirely neglected the significance of Heidegger’s characteristic employment of the double genitive throughout the original text. The unfortunate consequence of these and other infelicities may be an unnecessary obscuration of the original work through the interventions of the translation. As Kisiel notes, such ostentatious translation decisions only work to render even more opaque what is already a very difficult text– especially where, as in the case of ersehen, the terms in question have readily available equivalents in English. It might well be suspected that these translation choices represent a desire to forcibly exclude, or at least to discourage, readers who cannot grasp German to a level sufficient for reading the original. Such an aim would obviously undermine the motivation for translating in the first place. Particularly disconcerting is the concern that the ramifications of the now notorious translation blunders of The Contributions will have conspired to mar the reception of the text, especially amongst those non-specialist readers less schooled in the technical lexicon of Heidegger’s thought: those less prepared for the frustrating task of wading through the “mire” of Emad and Maly’s translation. A principal theme of the seminar discussion was the significance of interpretation for the task of translation. Once again, the group considered Emad and Maly’s Contributions as an example of how a lack of interpretive sensibility can lead to a loss of meaning in translation. Tracy Colony gave the example of the translators’ decision to render die Mitte (the middle, centre, medium) as “mid-point.” This decision, also described in Kisiel’s paper, opts for a “calculative” rendering of an important Heideggerian concept, the connotations of which are intended to extend well beyond the notion of an exact geometrical position. The original term, die Mitte is used by Heidegger to denote the idea of the middle as a site of mediation. Die Mitte also has important resonances with the Greek vox media (middle voice). The translation as “mid-point” is therefore grossly reductive – “a ruinous relapse into calculative thinking” which also “clearly loses the sense of a mediating middle region”. Emad and Maly’s decision here betrays a decisively un-Heideggarian indifference to the etymologically loaded substance of Heidegger’s writing. The critical consideration of Emad and Maly’s text allowed the seminar’s participants to explore the dangers of mistranslation, as well as providing the opportunity to attempt to rescue from obscurity some of the weightiest philosophical terms of Heidegger’s later philosophy. 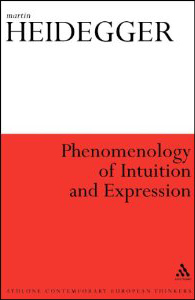 The seminar was particularly topical given the upcoming publication of Tracy Colony’s own translation, the first into English, of one of Heidegger’s early lecture courses – Phenomenology of Intuition and Expression (Continuum, June 2010).